Every day you get a day older. So do plants. While the biological daily clock ticks, time passes also for the aging clock. Scientists at the Center for Plant Aging Research, within the Institute for Basic Science (IBS), have found how the two clocks talk to each other genetically. 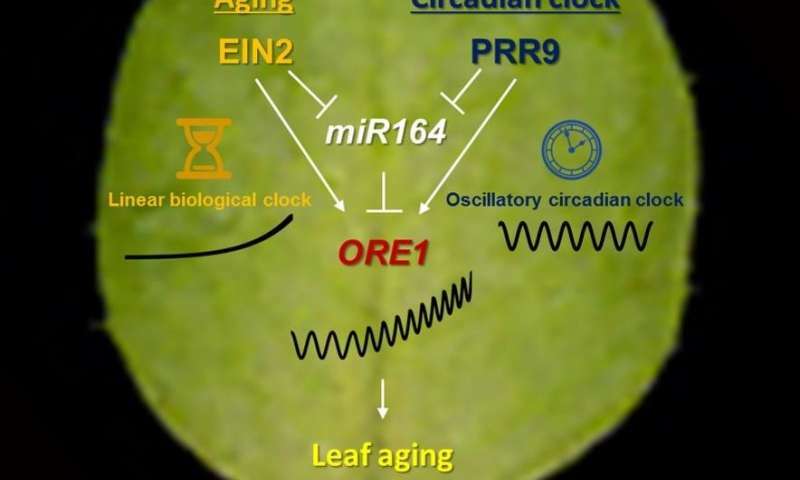 Plants' circadian clock—the 24-hour cyclic rhythm—plays a critical role in regulating aging, in particular, in timing the yellowing of the leaves. As aging plants recycle nutrients for the new leaves and seeds, uncovering these timekeeping mechanisms is important to understanding plant productivity. Most organisms are influenced by the daily and annual cycle of light and temperature. The circadian clock functions as a "mastermind" to align many aspects of development and physiology with certain times of the year or the day. In plants, the main gears of the daily clock are nine genes which have a peak in biological activity either in the morning (morning complex) or in the early evening (evening complex). They work as a network and regulate plant growth and flowering. In a study published in PNAS, IBS researchers used plants deficient in one of these nine core circadian clock components at a time to study the effect on the aging clock. In animals, the two biological clocks are interlinked; it was found that mutations in clock genes accelerate aging, and aging alters the circadian rhythmicity. However, the relationship between the aging and circadian clocks in plants has not been clarified yet. IBS researchers have used the model plant Arabidopsis thaliana and determined that some daily clock genes are directly or indirectly related to aging. To identify clock components directly involved in aging, the team examined the timing of leaf yellowing over time and in the dark, as darkness makes Arabidopsis age faster. 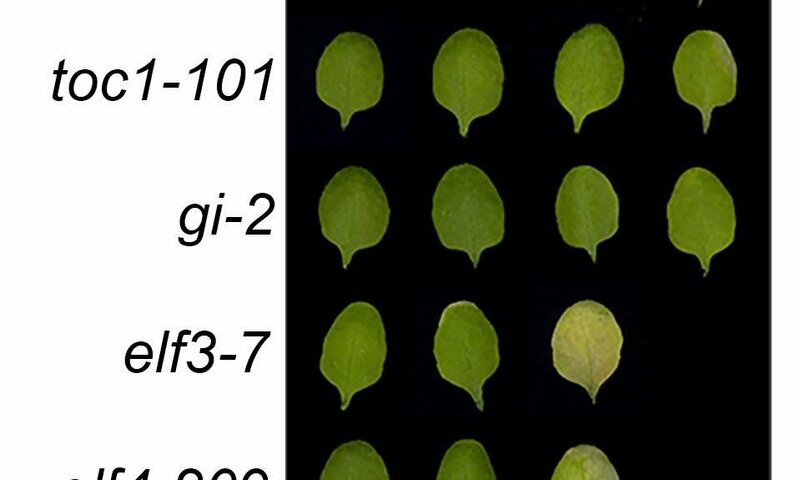 Plants lacking three components (elf3, elf4, and lux) of the evening complex had yellow leaves sooner, whereas plants without the morning component PRR9 (PSEUDO-RESPONSE REGULATORS 9) remained green for longer, showing delayed aging, in both age-dependent and dark-induced conditions. The researchers found that PRR9 plays an important role in the expression of a key gene for plant senescence known as ORE1. In this way, the two clocks interact with each other. "Time controls aging, but the question is how plants recognize the passage of time through their lifespan. 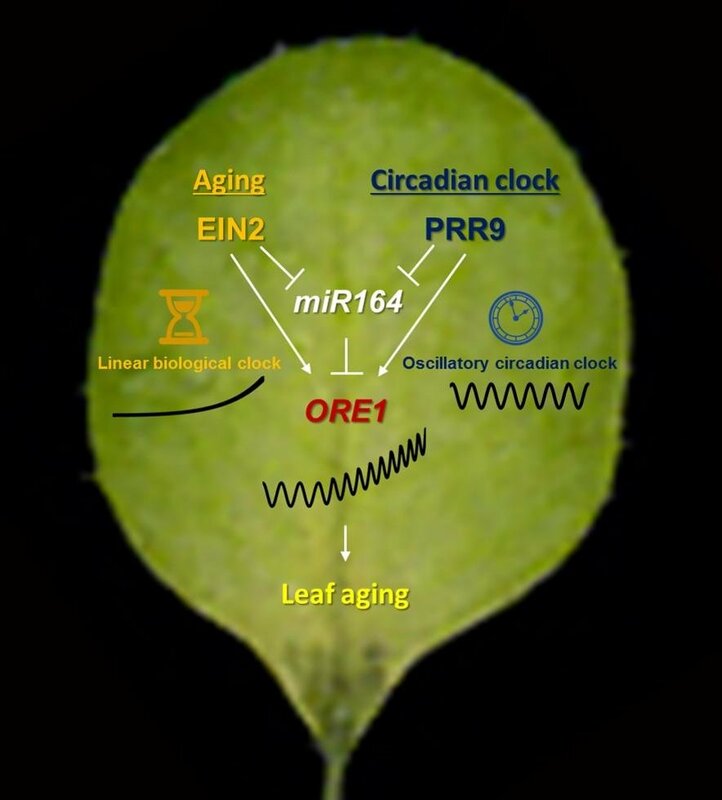 We found that the daily oscillatory clock interacts with the aging linear clock during the plant lifetime," explains NAM Hong Gil, the Center research director and corresponding co-author. In the future, the team would like to extend the network and understand how the circadian clock and aging interact with the external environment. Finally, the team would like to take advantage of the aging clock for regulating age-dependent developmental processes.